New Kids had the honour of playing the very final league match in the 2018/19 Dundee & District League season away against high flying Chieftains in Division 2. The latter stormed to a 6-0 commanding position. Fed up with this negative sequence, the Kids showed what they are truly made of in the doubles, slaughtering their opponents by the narrowest of margins in the final game. Howard Lee completed his strong season with a victory in the singles against Fiona Kinloch. But the Chieftans were doubtless happy to confirm their runner’s up spot in the division with a splendid 8-2 win. New Kids had the chance to leapfrog Truants for fifth place, but they would have needed 6 points from the last fixture and only managed 2. Overall, the three St Andrews teams dominated the middle of the table, with Swots earning a commendable fourth place, followed by Truants, while New Kids finished on the seventh rung of the ladder. Swots had already established that they were the stronger team reaching the final of the Secondary Shield cup, narrowly losing in the final. In individual averages, Nick Shepherd finished fifth with a win ratio of 76%. Division 1 was dominated by four teams who created a chasm with the rest of the league. Prefects, on the wrong side of the gap, still secured fifth place, partly thanks to the laudable performances of Michael Hahn, winning 39/45 matches (87%), finishing joint fifth in the individual averages. In Division 3, Prospects had to settle for fifth place overall, led by Chris Wroniecki with a 77% win percentage. The club rounded up the season with a local “hard bat” tournament, the Legacy Shield, which saw Chris take on the mighty Michael in a thrilling finale. Before revealing the winner, it is worth clarifying that the hard bat is a great leveller as everybody plays identical bats, without rubbers. The modern game is heavily affected by the spin and speed of various rubbers, none of which could be used at the tournament. The final last year had already opposed Michael to Chris, the former emerging victorious. However, this year Chris was more determined than ever to reverse the result. It started off well for him as he took the first game 15-11. And the second game was won on sudden death at 14-14, by … Chris, earning the right to have his name engraved below Michael’s on the trophy. The club would like to honour Michael, who will be leaving the area and therefore the club, as he will be completing his PhD (we hope) in the coming months. We wish him well in his future endeavours. This entry was posted in Match reports, St Andrews Table Tennis Club on April 15, 2019 by standrewstt. It was a busy week for the St Andrews teams as the 2018/19 league season drew to a close. In Division 1, the Prefects finished on a high by defeating Telstars 7-3 with two hat tricks by Michael Hahn and reserve Elaine Forbes. Playing up from Division 3, Sandy Pearson almost claimed his first Division 1 scalp but ultimately lost to David Monteith in five sets. Sandy did however receive a consolation prize in helping Michael win the doubles match. Swots had the pleasure of ending the season with two derbies, against New Kids and then against Truants. With both New Kids and Swots playing on their home turf, the rivalry between the two second division teams reached its pinnacle when Nick Shepherd and Howard Lee faced each other in the last deciding match. Nick’s perfect record against Howard over the past six years motivated both players. Beating the odds, Howard came out on top to secure a 5-5 draw in the fixture and a personal hat-trick. From the left, Swots with Dave Beveridge, Collin Bleak and Nick Shepherd, and from the right, Truants with Graham Wood, Alain Léger and Knut Radmer. Swots were also in a strong position against Truants going 5-4 ahead into the final match of the last derby of the season. Dave Beveridge was hoping to repeat a strong performance against Alain Léger to avenge his team, after Truants defeated Swots 6-4 in their previous encounter. The Frenchman took the first game by the smallest of margins, but Dave reacted well and levelled the match in the second set. However, the latter was very slightly worse for wear in what turned into a war of attrition. Alain saved Truants from defeat to complement Graham Wood’s man of the match performance and end the night with a 5-5 score line. Truants had a less fortunate night the week before against top of the league Villa, losing 8-2 at home. In Division 3, Prospects could only field two players in Broughty Ferry against Duffers. The home team were dominant all night, only yielding Sandy Pearson and Ian Brumwell one win each as well as the doubles match, although Prospects could have drawn as they lost two matches at the end of two very long five setters. In their final week, Prospects faced Division 3 runaway champions Tass, who were undefeated all season. Whilst Tass were able to preserve their unblemished record, Prospects gave them a fright, and managed to draw 5-5 thanks to man of the match Chris Wroniecki with a hat-trick. 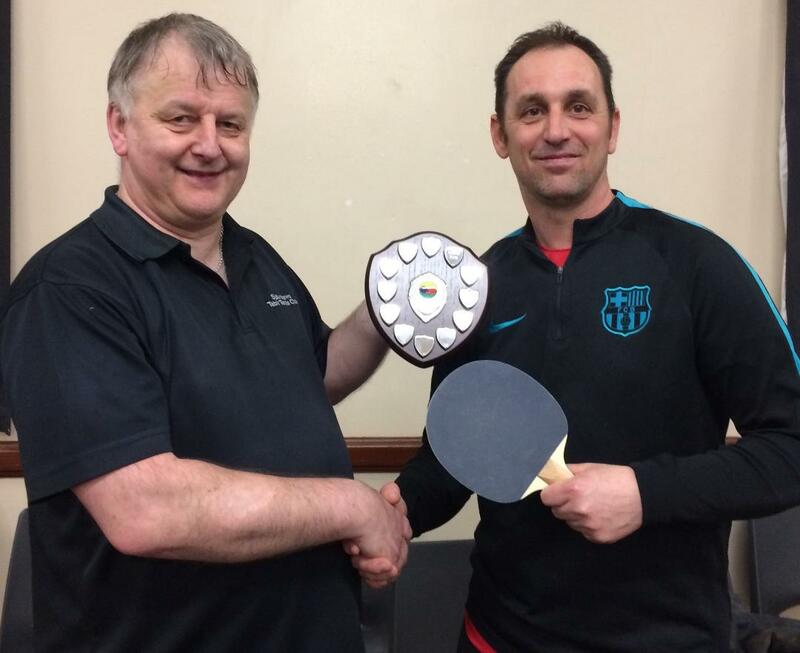 This entry was posted in Match reports, St Andrews Table Tennis Club on April 4, 2019 by standrewstt. Prefects were missing their best player to receive Knights, riding high in second place in Division 1, but then again Knights were also without their star. Victory was never in doubt for the visitors as the hosts fielded two reserves. There were some very high-level rallies, and Elaine Forbes even managed to save Prefects from a whitewash by beating Andrew Nimmo in five sets. Final score 1-9. Prefects were sharing the Victory Memorial Hall with Swots, who were hosting the firemen from Kingsway in a Division 2 encounter. The teams shared the first four points equally, but it was all downhill from then for the firefighters who couldn’t put out the flames of “on-fire” Nick with another man-of-the-match performance. He was well supported by Collin in the doubles and two single wins, and Dave Beveridge with one win. Swots ended the night 7-3 up against the firemen. Meanwhile in Broughty Ferry, New Kids had a difficult night against Sputniks. Although the teams were neck and neck all evening, at 4-4, Sputniks took off with the last two points available to win 6-4 at home. Truants were at home against the second-best team in Division 2, the Chieftains, who showed no mercy in the opening four matches before Alain Léger managed to beat Jim Tawse in five games. The latter also lost to Graham Wood in five games just before Knut Radmer very nearly caused an upset and only just lost in the deciding game against young rising star Jacob Munro from Chieftains. Jacob was undefeated on the night, as was Fiona Kinloch. Truants salvaged two precious points from the fixture. Finally, Prospects were playing away against another space-themed team, Astronauts, in Broughty Ferry. Prospects were pleased to welcome round-the-world-traveller Sandy Pearson back to the team. If it wasn’t for Euan Steel for Astronauts, Prospects would have sent them into orbit as they won all of the singles and the doubles match to claim a solid 7-3 victory at Forthill. This entry was posted in Match reports, St Andrews Table Tennis Club on March 14, 2019 by standrewstt. Prospects were delighted to collect 10 free points last week as their opponents forfeited the match due to not being able to field a team and rescheduling was not possible before the official end of the season. Meanwhile, Truants and Swots clashed in a second division derby in Gauldry. Swots started strong with Dave Beveridge and Nick Shepherd overcoming Knut Radmer and Alain Léger. Graham Wood then put Truants on the score sheet with a straight games win over Collin Bleak. Dave returned to the table against Alain for a great performance. Alain had three match points in the deciding game, but Dave held his nerve to win the next five points for a 12-10 win, including a superb return from a strong attacking shot. Knut then created the first upset of the night as he beat Collin in the fifth game before the headline match of the night: Graham versus Nick. It was a tense battle but Graham came out on top, as he did in the thrilling doubles match aided by Alain, against Nick and Dave. Collin then easily defeated Alain in style, as Graham also beat Dave in three games. Nick was hoping to save Swots from defeat against Knut in the final match of the night, but Knut pulled out an extraordinary performance to give Truants the winning point. Man of the match performance for Graham, undefeated all night, but Dave and Knut with two wins each went home with plenty to be happy with. The two teams will meet again in four weeks to play a re-arranged match from the first half of the season, Swots will be hungry for revenge then. New Kids were up against the Lundin Links Lasers at home last week. Arthur Duncan and Robert Brown from Lasers were both undefeated except when they lost the doubles match against Howard Lee and Ian Smith, who both beat Nat Forno in the singles. Final result 7-3 for the visitors. Finally, in the first division, Prefects were away to Forthill to play Defenders last week. The former had no choice but to field two reserve players for the fixture: Graham Wood and Howard Lee. Howard narrowly lost two matches against Kenny McLaren and Ken Head but Graham was able to comfortably beat the same players, as did Bonifac Legrady. However, none even came close to causing problems for Jos Berkhout, who was head and shoulders above the rest. Defenders defended their home ground well with a 6-4 victory. 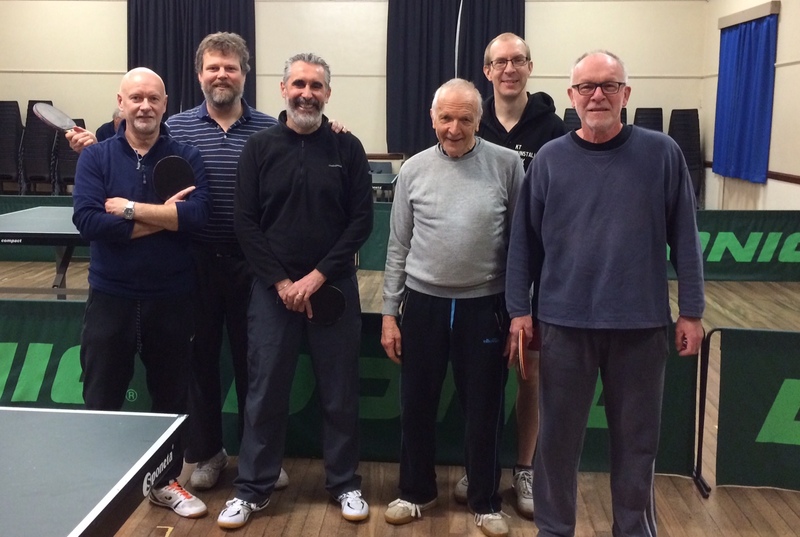 This entry was posted in Match reports, St Andrews Table Tennis Club on March 5, 2019 by standrewstt. A last-minute injury for star player Michael Hahn meant that Prefects were at a severe disadvantage against Viscounts in their Division 1 fixture. Facing a two man team, Viscounts took no prisoners and inflicted a complete whitewash over the remaining Prefects Jean-Augustin Touton and Bonifac Legrady. New Kids were at Forthill in Broughty Ferry to face Tigers in Division 2. It ended up being a very close match, with quite a few surprising results. Man of the match Howard Lee took a hat trick of singles wins while Ken Falconer added two excellent points for the St Andrews team. Ian Smith had an off-night, unable to contribute to the 5-5 scoreline. At Ward Road gym in Dundee, a beatable Barons team was waiting for Truants who relied heavily on team Captain Graham Wood to deliver the points as Knut Radmer and Alain Léger struggled. Barons kept their cool and seized 7 of the 10 points available as Graham secured three wins including the doubles match. Nick Shepherd kept Swots in the game against Chieftains with a stellar performance after winning all his of singles and the doubles match aided by Collin Bleak. Dave Beveridge has been struggling since his injury, but Chieftains are a tough team and showed him no mercy. The fifth point was snatched by Collin in the fifth set against Jim Tawse to secure a draw. Finally, Prospects were keeping Truants company at Ward Road Gym, facing Lairds in Division 3. Prospects opened up an early two point lead against fierce competitors who were chasing all night, but Chris Wroniecki secured victory after winning all three singles and the doubles match with Charlie Ross. Both Charlie and Ian Brumwell earned a point to contribute to the 6-4 win. With four matches left in the league, Prefects are still in fourth place in the top division, but their considerable lead has almost vanished, and with a couple of difficult weeks ahead, they could tumble down the ranking quickly. In the second division, Swots and New Kids are in a good position to avoid promotion as well as relegation while Truants are second from bottom but with three matches in hand, which should suffice to keep them in second division next year. Prospects are in third place in the third division but with a few teams breathing down their neck, they would do well to maintain that position. This entry was posted in Match reports, St Andrews Table Tennis Club on February 26, 2019 by standrewstt. Several matches were disrupted and two were postponed last Tuesday as a result of an incident on the Tay road bridge. Unfortunately, two St Andrews teams were affected and now need to reschedule their fixtures. In Division 2, Truants waited to no avail for their opponents, Sputniks, who were unable to cross the Tay. Heading in the other direction, the New Kids, were thwarted in their efforts to play Chieftains in Dundee. Meanwhile in Division 1, Prefects welcomed Aces to St Andrews on Monday. Aces are the current division leaders and were ahead throughout the fixture. However, excellent performances from Michael Hahn and Justin Yang allowed Prefects to come away with three out of the ten points. On the other side of the Victory Memorial Hall in St Andrews, Swots received Barons in a second division encounter. The man of the match was undoubtedly Nick Shepherd who won all three singles in straight sets and the doubles match with the help of Dave Beveridge. Collin Bleak added a fifth point for Swots to secure a draw 5-5. This entry was posted in Match reports, St Andrews Table Tennis Club on February 20, 2019 by standrewstt. Competitive action last week was devoted to three fixtures in the second round of the Handicap Cup. The Handicap Cup is often a good leveller, giving a better chance for teams in the lower divisions to compete by assigning handicaps according to ability levels. For instance, a third division player might start the game on 20 points and a first division player would begin on 3 points; first to 31 points wins. Prospects (Division 3) were playing at Ward Road Gym in Dundee against first division title contenders Knights. The hosts were all starting on 3 or 4 points while the guests’ starting score ranged between 16 and 20. Despite the generous lead awarded to them, Prospects only managed to win two game while Knights secured the ten needed to progress to the next stage of the competition. New Kids (Division 2) were hosting Tass (leaders of Division 3) from Dundee at the Victory Memorial Hall in St Andrews. Despite the favourable handicaps, Tass still had a mountain to climb as they could only field two players including a reserve. However, it proved easier than a short walk in the park as they surprisingly won every single game they played. Given the emphatic result, New Kids will doubtless be traumatised by the handicaps assigned for the match. On the other table, Swots (Division 2) were playing Earls (Division 3). Both teams had brought a reserve player, which made some of the handicaps slightly unorthodox. This fixture was probably the most balanced of the three, and after the first three matches, the teams were neck an neck with three points each. However, Earls took control of the match in the next three by grabbing all six points available. Collin Bleak kept the Swots’ hopes alive in game 7 by breaking the Earls’ impressive winning streak but then succumbed in the next game, handing Earls the tenth and qualifying point. The fixture was played out, but Swots had no complaints as Earls took the remaining points anyway. With all the St Andrews teams crashing out of the Handicap Cup, the focus returns to league matches next week. This entry was posted in Match reports, St Andrews Table Tennis Club on February 13, 2019 by standrewstt.